Irish whiskey is a bit of a blind spot for me and in 2014 I am going to try and drink more of it. I have to say the little that I have tried so far has not thrilled me overmuch. I liked the Tyrconnell NAS at the price and the Redbreast 12 at its introductory price (in the low $30s) but the rest I’ve either found to be not very good or overpriced for what it is. Let’s see where this Powers John Lane falls. It is a single pot still whiskey from the New Midleton distillery who also produce Redbreast, Green Spot, and most famously, Jameson. This is from a mix of bourbon and oloroso sherry casks and I believe the bourbon casks are predominant in the vatting. Nose: Not terribly expressive at first. But then some sweetness shows up: simple syrup and then orchard fruits (apples and pears and a bit of apricot after a while). With a little more time the apricot shades towards orange peel and the wood becomes more apparent as well. The fruit gets a little deeper with time. A hint of milk chocolate a la Redbreast 12 after a while. After a lot more time some honey and some malt join the fruit and the nose gets a lot richer (will this be replicated on the palate as well?). Nothing interesting with water. Palate: Hmmm as on the nose, this doesn’t make much of an impression at first. Nice mouthfeel but not a whole lot of distinct flavours. Let’s give it some time. No, it just kind of tastes like generic whisky: there’s some prickly wood, some very mild fruit but nothing that seems to want to leave a mark. And time doesn’t do as much for the palate as it does for the nose. Gets more astringent/metallic as it goes. Will water help? No, water does not help. Finish: Medium-long. Some sour wood and some salt but that’s it at first. With more time there’s more fruit on the finish (and more than on the palate). Comments: Irish whiskey aficionados say very positive things about this one but it doesn’t really hit any highs for me. I liked the nose but found it somewhat blank on the palate. Can it be that the general profile of Irish whiskey just isn’t for me? Thanks to Michael K. for the sample. 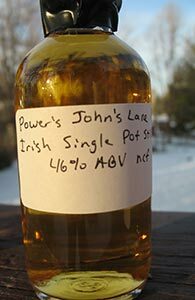 This entry was posted in -Whisky by Rating, 80-84 points, Midleton, Powers John Lane. Bookmark the permalink. I tried this guy tonight. High hopes. I thought this might be the Xmas bottling I buy for friends this year. Really cloying sucrose. One harsh note of astringent vanilla’d whisky. Neat, I’d rate it terrible. Oof.